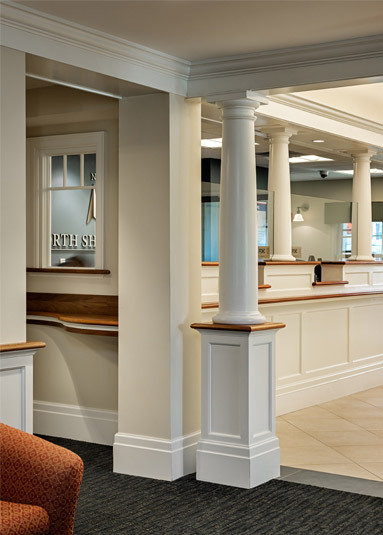 This branch of the North Shore Bank has a storied history and because of its illustrious past, it was an honor for TMS Architects to design a renovation that updated the bank’s appearance and functionality while respecting the historic character of the original structure. Built in 1845 by shoe manufacturer Alfred Fellows, the home was designed in the then-emerging New England Greek Revival style. Although the original structure is of architectural merit, the remarkable history of those that lived in and visited the home make it truly unique. Mr. Fellows and his wife Nancy were activists for the anti-slavery movement and notable abolitionists and intellectuals of the time such as Harriet Beecher Stowe, William Lloyd Garrison, Ralph Waldo Emerson, Oliver Wendell Holmes and John Greenleaf Whittier were all frequent visitors. The Fellows’ daughter Evelyn married Captain Charles Masury in 1877, lived in the family home her entire life and carried on the family tradition of political activism as she was an ardent worker for the Women’s Suffrage movement. 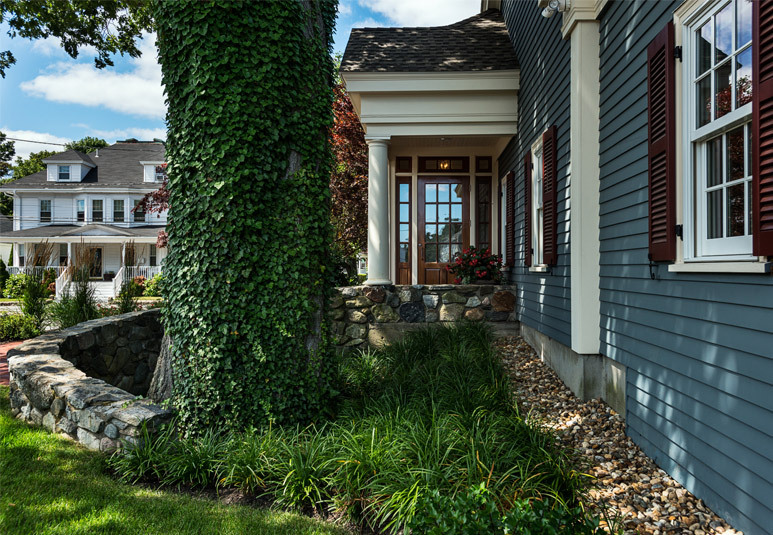 The home had a beautiful garden and the great oak tree that was planted by Nancy Fellows exists today by the bank’s back entrance. The bank had been remodeled in the 1980’s and an addition had been added to the original structure at that time. TMS Architects was asked to enhance the bank’s appearance and improve the function of the public spaces. 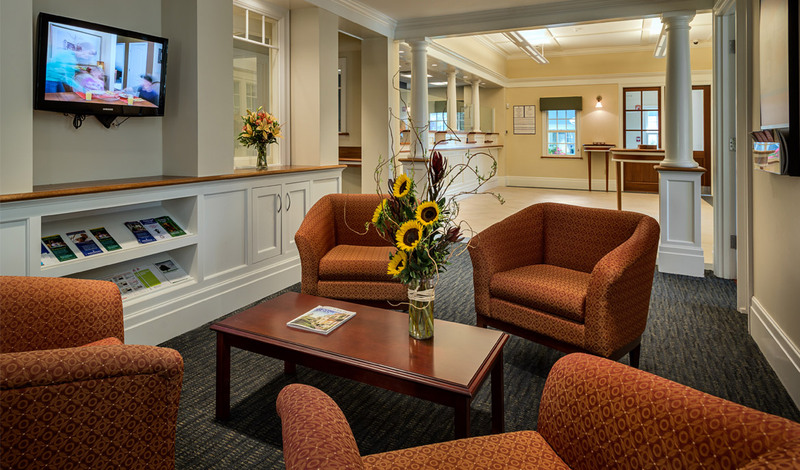 The bank wanted to make the interior spaces feel larger and to create a more welcoming lobby space for customers. TMS was able to accomplish this by raising the ceiling heights whenever possible and opening up some of the walls that were so constraining. 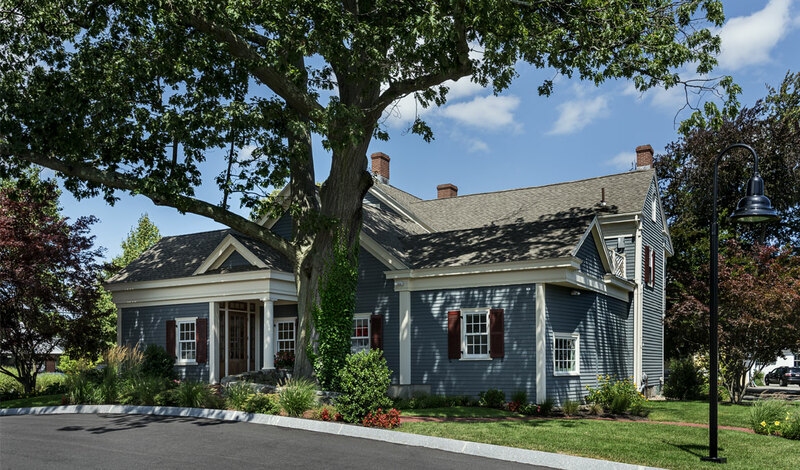 The first floor was completely renovated and reconfigured and by doing so, the bank was able to gain an additional office and conference room. All the windows were replaced and up-to-date data systems and HVAC systems installed. New entrance canopies were designed and the walkways and stairs were landscaped. However, at the end of the project, the essence of “The Old Homestead”, as it was originally named, shines through and flourishes in its present incarnation as a bank and vital member of the downtown community.